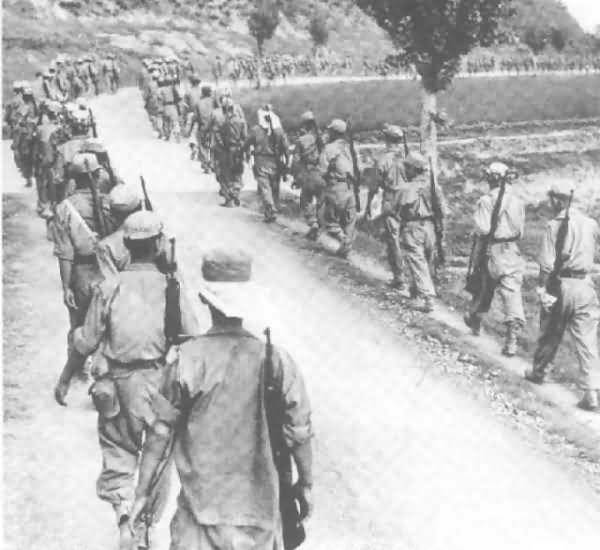 In June, 1950, the ROK army, equipped with used American small-arms, little artillery and no armor at all, were crushed by the North Korean People's Army, the In Min Gun. North Korea's army of thirteen infantry divisions and 150 T-34 tanks, armed with the whole family of soviet infantry weapons, simply crushed the stunned ROKs. The Truman Administration presumably hadn't provided armor and heavy artillery to the ROK army because they didn't trush Rhee. Some considered him a loose cannon who might well have attacked the North himself if he had been better armed. Perhaps providing substantial armor would have been questionable, but what about anti-armor? 3.5 in rockets (Super Bazookas) might safely have been supplied, and might have been enough. Still, even the infantry small arms were unsuited for the troops who fought to the death using them. Our 44" long, 11 pound M1, magnificent in the hands of our large soldiers, was too heavy and awkward for the smaller ROKs. Their enemies, of comparable physical size, were mainly armed with the 40" long 8.8 pound SKS. The SKS was not only as accurate as the M1 at the close ranges the battles were fought, but had lighter recoil, loaded 10 rounds compared to the M1's 8 rounds, and a skilled soldier could fire 35 aimed rounds per minute. We had weapons suitable for their body size, such as Grease guns (M3A1), and also had selective-fire M2 Carbines, but did not supply them. Truman was convinced that nuclear weapons had ended all infantry wars, and may have thought the greatest danger would be Rhee might start one in an isolated instance of arrogance. He evidently failed to realize that nuclear weapons didn't eliminate infantry wars, they made infantry wars the only practical kind. Plus, Truman and his cabinet did not appear to see a difference between Communism and Stalinism, perhaps influenced by American communists and Soviet operatives such as Alger Hiss. In the event, Truman fired his Secretry of Defense Johnson, but as always, brave soldiers and innocent civilians paid the price for political error. The company in this photo carries only Carbines, Rifles, Cartridge belts and canteens. They were deploying to set up a blocking skirmish line. Perhaps most of these troops had been picking apples in Masan or stocking shelves in stores, just two months before. Most of them might have been killed by tanks, crew-served weapons and artillery two days later. Note how large the M1 seems on these small men, as compared to the carbines. All in all, they did the best they could.